What's the fuss about this little island country so far away in the Southern Ocean? What keeps drawing me back? Come to the Walking the Wild presentation on June 14 to find out! Warning: New Zealand is seriously habit-forming! In the grey of very early morning I was awakened by fluttering, scuttling, and pecking on the metal roof. 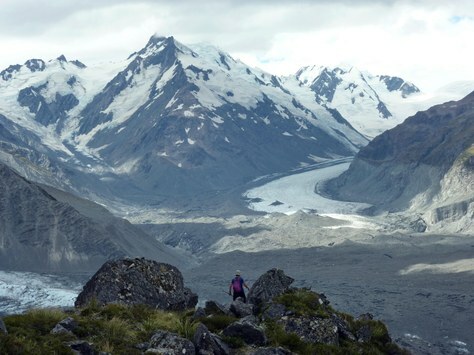 The tiny, three-bed Ball Hut is perched on the moraine of the Tasman Glacier in Aoraki-Mount Cook National Park. 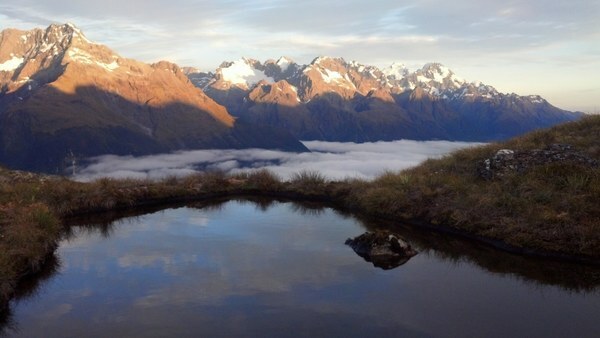 On New Zealand's South Island, the hut is just a stone's throw away from the sheer 6000-foot Caroline Face of Mount Cook. 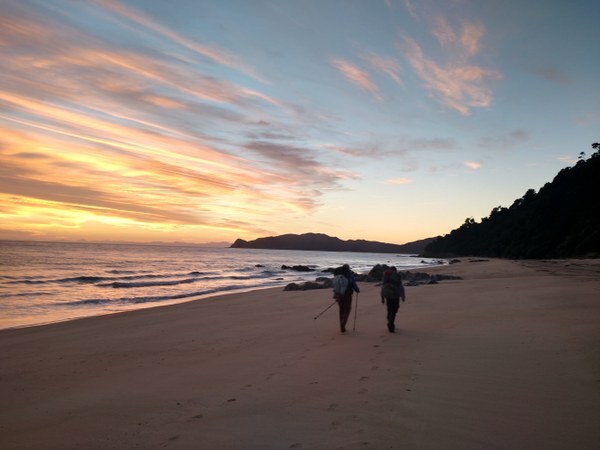 It was our last day on a three-week sojourn along five Great Walks, tramping tracks on the North and South Islands of New Zealand. Cup of hot Via in hand, I made my way to the porch of the hut and settled there, wrapped in my down bag. 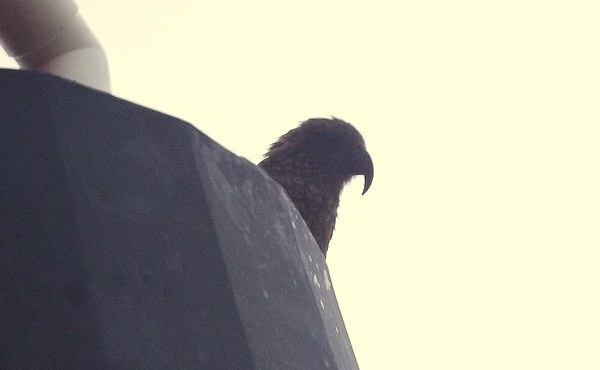 As the light grew I saw the outlines of a kea – New Zealand’s iconic alpine parrot - looking down at me from the eave. 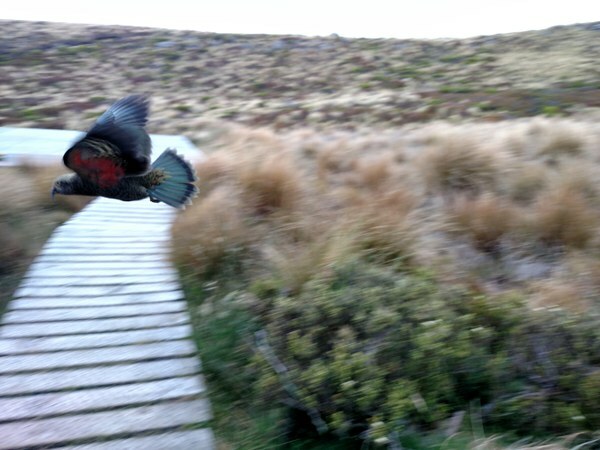 Shortly another kea joined the first one, alighting on one of the hut’s cable supports. Within a few minutes there were five, then eight more keas hopping closer, their curiosity and intelligence evident. Eventually, as we packed up and made our way back down the moraine, there was a group of thirteen keas following us, flashing the brilliant orange and green undersides of their wings as they fluttered along the hillside by the trail to keep us in sight, occasionally shrieking ‘KEE-ah, KEE-ah’ to each other. When we would stop to take pictures and enjoy their antics, they would stop to hop and preen and fluff their colorful wings and chatter. Finally, there was the heartbreaking, inevitable moment as we neared the trailhead that the keas gathered themselves as if by an unheard signal and flew back up toward the hut, presumably to investigate the next group of visitors to their domain. What a gift of welcome and special joy, to match the treasure chest that New Zealand had already delivered to us. I’ve been to New Zealand six times now, three with groups of Mountaineers, and each time my heart has been captured just a little bit more – not just by the staggering richness and variety of scenery, and the craggy snowy peaks so like home but still enticingly different, but also by the can-do, down-to-earth, welcoming people. Every time I depart the place I wonder if I'll ever go back....but it doesn't take long before I find it hard to imagine staying away. Imagine endless alpine ridge-walking with deep blue lakes and ocean below; golden-green sheep-dotted hills overlooked by snowy mountains; deep sheer-walled fiords carpeted with ancient podocarp and tree fern forests and gushing with waterfalls; sweeping white-sand beaches with turquoise water framed through the tree ferns; steaming volcanoes and multi-colored thermal flats; exotic native birdlife.... New Zealand is a nirvana for people who love a physical challenge while surrounded by incredible unspoiled scenery. 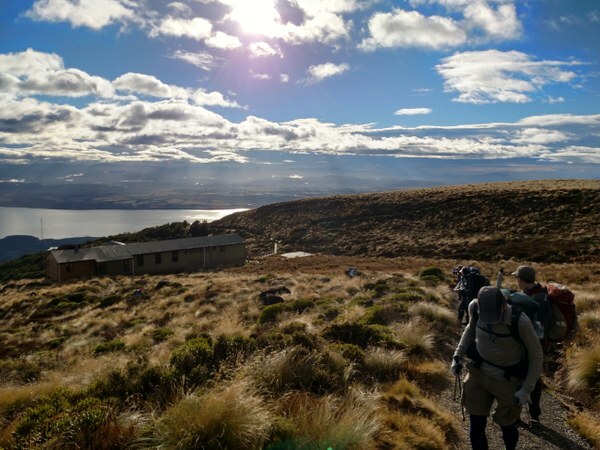 For backpackers (the Kiwis call them ‘trampers’) the country offers nine “Great Walks” – premier walking tracks of two to seven days length that pass through the country’s diverse and stunning landscapes. 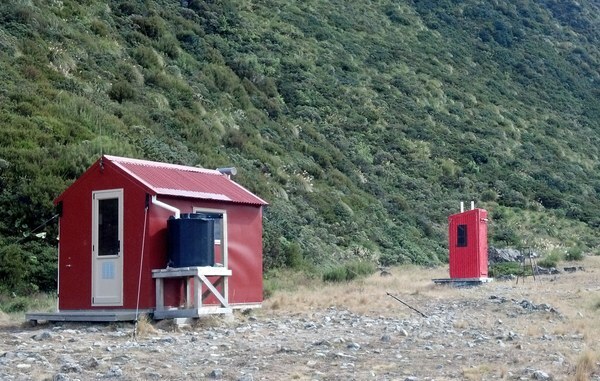 The “Great Walks” have well-equipped staffed huts, well-formed trails and convenient transport services, and can generally be booked in advance. But these are just a fraction of the hundreds of long and short walking trails throughout the country’s National Parks and other wildlands, with basic ‘first-come-first-served’ huts and campgrounds conveniently scattered along their length. 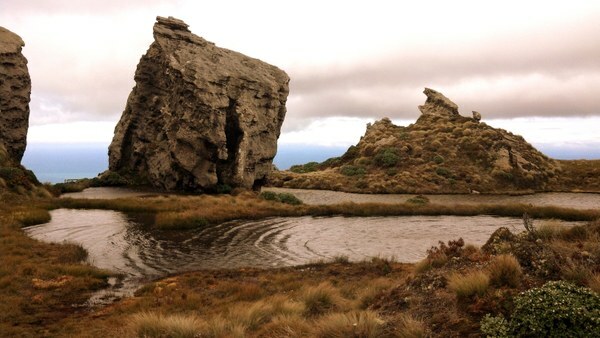 Public bus and private transport services link the country’s towns and cities with parks, trailheads and major sights, accommodations come in a diverse range from inexpensive to luxurious but always with special “Kiwi hospitality”, and the food and wine scene is outstanding. In this fifth presentation in the Walking the Wild series, fellow New Zealand vagabond Eileen Miller and I – both having been drawn back to this lovely little country multiple times – will share our experiences and photos from several of the Great Walks and stunning tramping trails across New Zealand, and will offer suggestions for how to get around, what to pack and how to plan and book a trip there. We hope you’ll be able to join us! For me it’s a love story with a place and a people – and one I’m sure hasn’t nearly played itself out yet!